Carpet spots and stains can be a major irritation. Here are some simple carpet spot removal tips in Vestavia, AL. The first and most important tip is to act quickly. Many carpets have already been treated with some sort of solution such as scotch-guard in order to resist stains. So, if you take immediate action, you can easily remove most spots, stains or spills. The longer you delay, the greater the chance that the spill or stain will set in and be more difficult to remove. First, blot up as much liquid as possible with paper towels or an absorbent white cloth. One thing you should not do is scrub. Try to blot up as much of the stain as you can, but do not scrub. Scrubbing can rub the spot further into the carpet. The objective with blotting is to pick up as much of the stain as possible before it sets in. After blotting up as much as possible, you can apply a spot removal spray or solution, but prior to using a solution you should pretest it to make sure it will not dye or damage your carpet. To pretest the solution, apply several dots to an inconspicuous area of carpet. Hold a white cloth on the wet area for 10 seconds. Examine the carpet and cloth for color transfer, color change, or damage to the carpet. If a change occurs, do not use that solution. Try another cleaning solution. 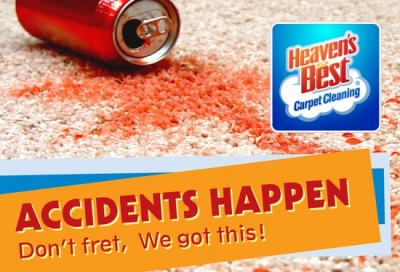 We recommend Heaven’s Best Spot Remover as it is safe for most carpets and cleans extremely well. Apply a small amount of Heaven’s Best Spot Remover. Allow the solution to sit for about 10 minutes. Using a white cloth or paper towel, gently blot the spot, working from the edges of the spill inward. Do not scrub! Continue to blot, absorbing up as much of the liquid and the stain. Repeat this process if necessary. Be patient! If this does not work, call Heaven’s Best Carpet Cleaning at (205) 618-9150. We have professional strength spot removers that will remove almost any spot or stain. For the best carpet spot removal in Vestavia AL, try these tips first, and then call Heaven’s Best.